Education Princeton College; read law with Judge Henry St. George Tucker, of Va.
Military Note Downey, William. Pa. Pa. Ens 16 infantry 14 July 1813; 2 lieutenant 15 Aug 1813; 1 lieutenant 22 Feb 1814; honorable discharged 15 June 1815; 2 lieutenant 5 infantry 3 Sept 1816; honorable discharged 1 June 1821. Mother RUHAMA STOCKSDALE, b. Abt 1750, Lancaster Co., Penn. 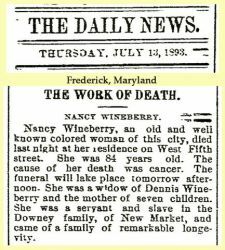 The obituary of Nancy Wineberry, servant and former slave, clipped from The Daily News, Frederick, Maryland, 13 July 1893. I have linked her to Downey family members she may have known. After his marriage, he settled on the Brick House farm in New Market, Maryland. He built the east end of the house in 1820. Represented Frederick Co. for one term in the Maryland Legislature. A law was passed granting him the right to transport his 18-20 slaves from Virginia to Maryland.